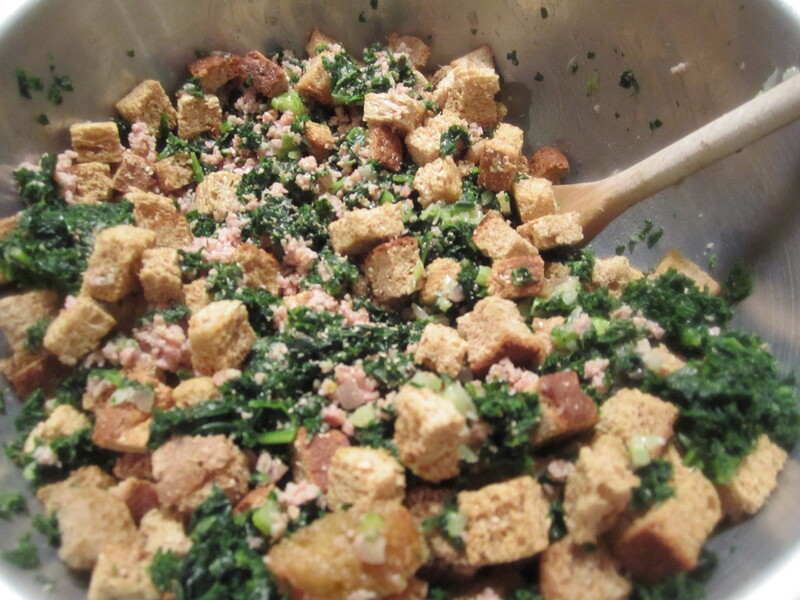 I have several ingredients in the house which have inspired me to make a fall stuffing–bread, kale, sausage, sage, shallots, celery and broth. The only thing that remains to be bought is the turkey. Therefore, I bought a boneless breast already tied into a roast. This is something my butcher regularly carries and is a great time saver–free-range and organic, to boot. I decided to brine it because I had the time and because the leftovers are nice and juicy–like cured meat. 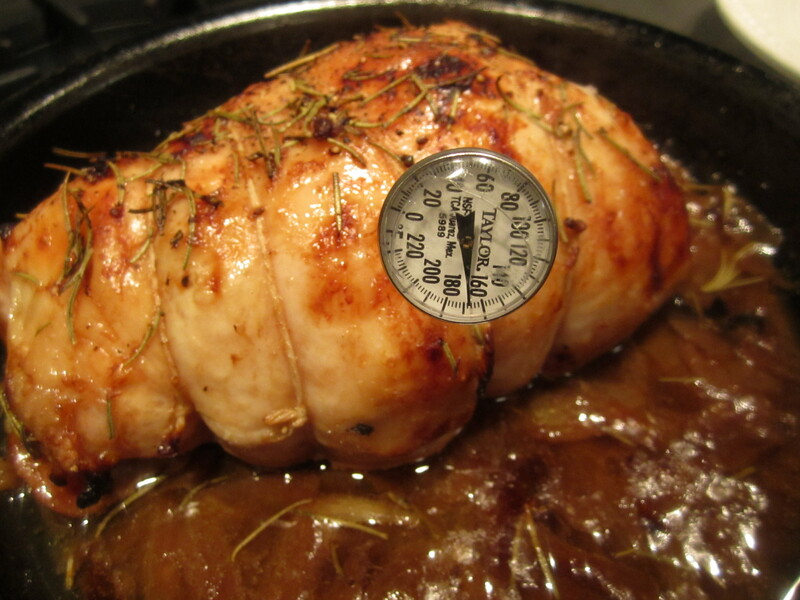 For the method, see my brined turkey breast. As for the stuffing, it’s a combination of my own method and a little nod to my neighbor, Beppi. 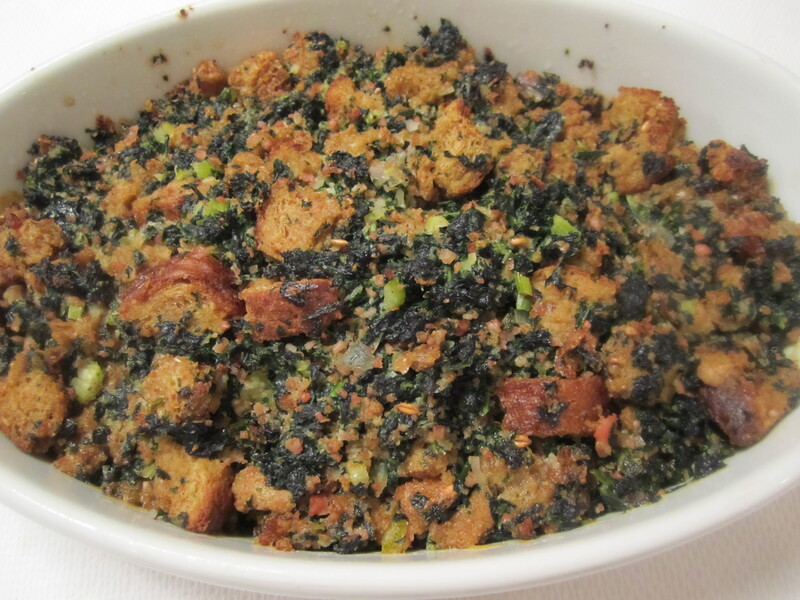 Beppi puts mortadella and luganiga sausage in his stuffing, as well as the traditional breadcrumbs and herbs. I’ve decided to add these meats, since I already have them in the fridge. I also happen to have a loaf of whole wheat bread in the freezer and I love the flavor and texture of whole wheat in stuffing. It has a nuttiness that combines well with butter, sage, celery and onions. 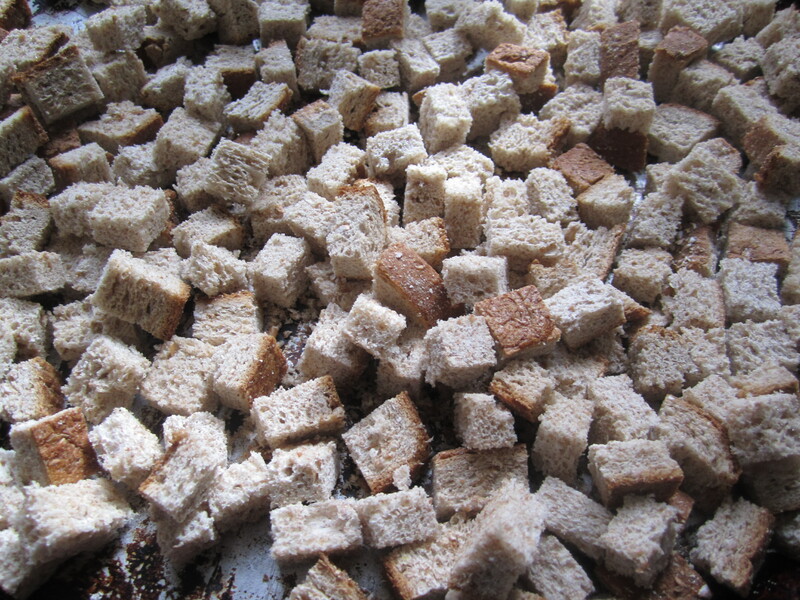 The process begins with toasting the bread cubes in a low oven until they’re dried out and crunchy. 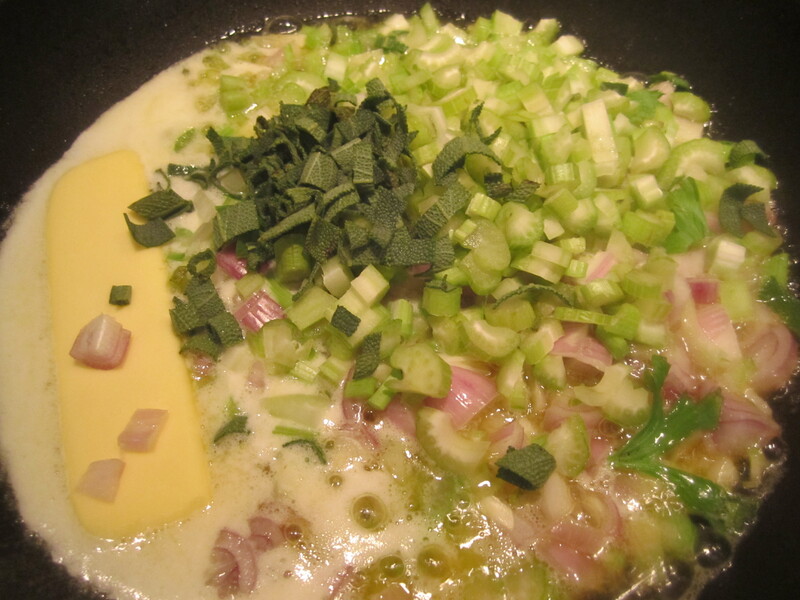 Then the celery and shallots or onions get sauteed with butter and sage. 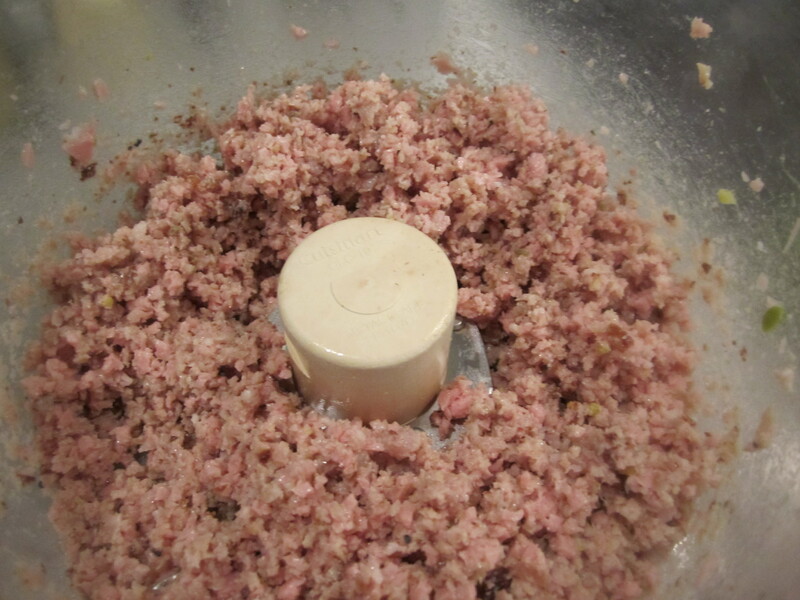 The mortadella and pre-cooked luganiga sausage get minced in the food processor until they form a paste. Kale is boiled, then coarsely chopped and added as well. The whole mixture is bound with enough broth to make it moist and cohesive. 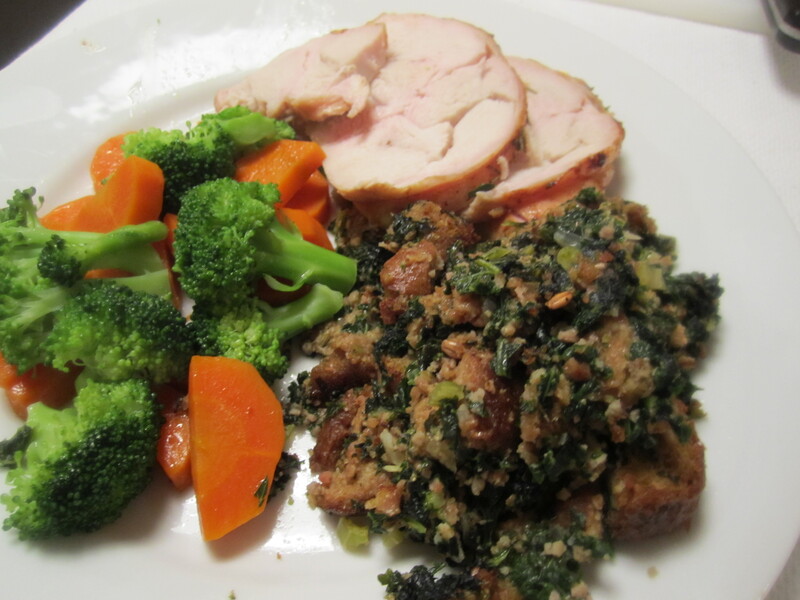 The kale lightens the stuffing and gives it a nice green flavor and color. I made the stuffing and added it to the oven during the last 45 minutes of cooking my turkey breast. Some carrots and broccoli added more fall flavors to the plate. Slice bread into 1″ cubes and toast in a 250 degree oven for about an hour. 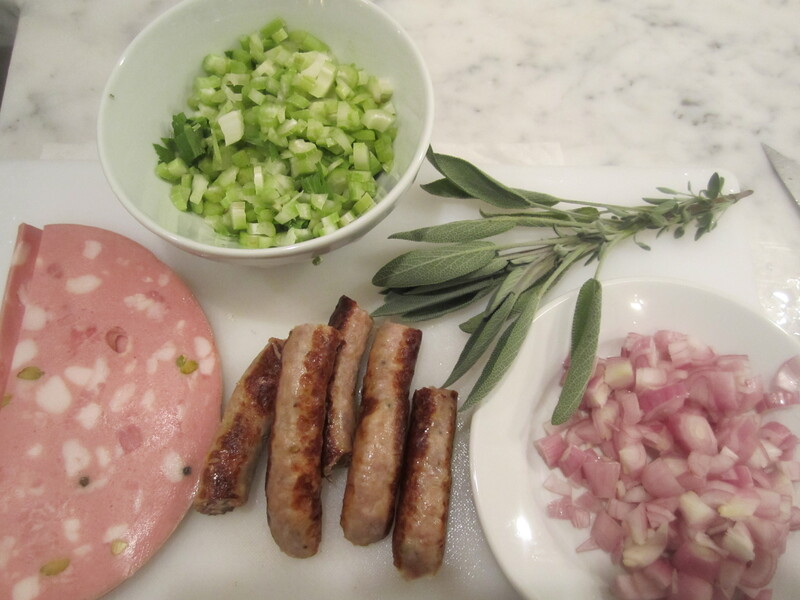 Cut sausage and mortadella into 1″ cubes and process to a coarse puree in the food processor. Set aside. 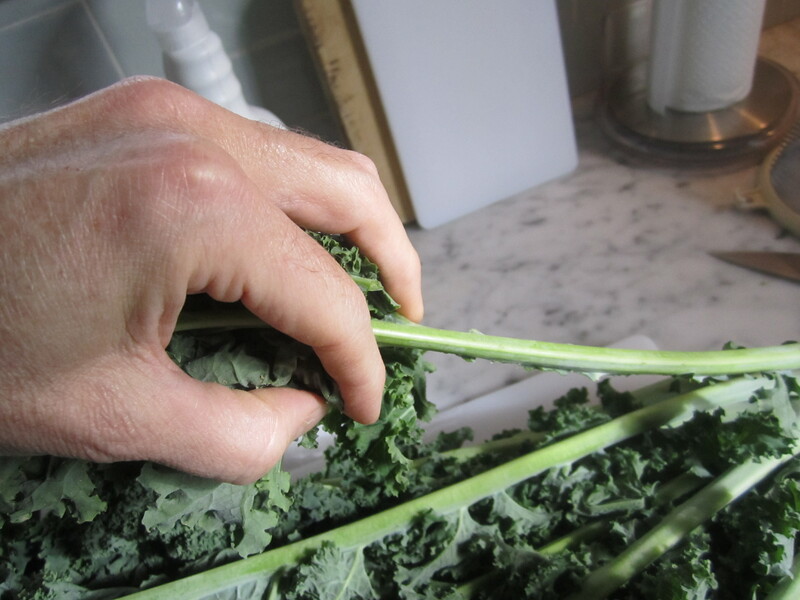 To prepare kale, strip leaves off stems. Slice into 1/2″ ribbons and blanch in boiling salted water for about 5 minutes. Drain, set aside. After kale has drained, pulse a few times in the food processor (working in batches if all doesn’t fit at once) to achieve a coarse chop (alternatively, chop by hand until coarsely chopped). In a skillet on low heat, place butter, shallots, celery and sage. Saute for about 10 minutes or until vegetables are wilted and soft. Combine all ingredients except broth, in a mixing bowl. Add all but one cup of broth to mixture, then transfer to a buttered baking dish. Cover with foil, bake for a half hour, then uncover. Taste for moisture and if too dry, add more broth. Continue baking for another 15 minutes, uncovered or until top has browned slightly. Serve alongside a juicy, salty, perfectly roasted turkey breast.